I pose a very simple question to all readers of this blog and to all your followers too. 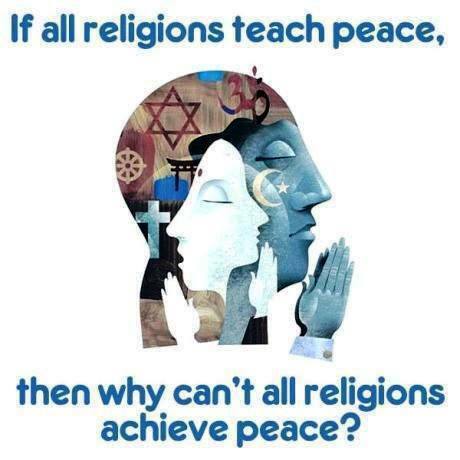 If all religions team peace, then why can’t all religions achieve peace? Is it not time for us to put our differences aside and come together just as our religions say deep within their ancient texts, and live as one in PEACE! This is indeed a wonderful question! There is so attachment and imperialism within each strand of religion, that delusions of power creep in. The gods once walked among us when our divine spark was a bright flame and our karmic debts were small. I believe we can go beyond all religious frameworks and dualities though and I’m working to create such a community at the moment, which I’ll let you know about if I may. I really believe we can all be one faith in one heart again one day like we were in the Golden Age! This is a short article on the very subject which is part of a larger series. I have occasionally pondered this sort of question — why religious people cannot make peace amongst each other (or themselves) — and I always come back to a fundamental teaching of the Buddha: attachment to views. If one is convinced that his views are right and all others must be wrong, than one can eventually be persuaded to offend, hurt, and ultimately kill those who hold strongly to opposing views. I don’t know for sure whether other religions preach non-attachment to views… so I’m not sure how other religious teachers really work with this sort of thing. I only know that I have learned to live with the fact that others aren’t going to share my views, and quite frankly, life is made very interesting by the interactions that come about as a result of others’ views. May we each learn to live in peace with those who live their lives by different creeds, on different paths, and with different views. Please be well!